PokerMoments is a poker blog, not a political blog, and hence not generally in the business of making political statements. However, as Barack Obama moves past Hillary Clinton in the primaries, and could very well become the Democratic Presidential Nominee for 2008, I feel compelled to add my two cents into the political pot. While Obama, if elected President, might be good for the game of poker, as he is supposedly an avid poker player, I cannot vote for him. Here are 3 reasons why. 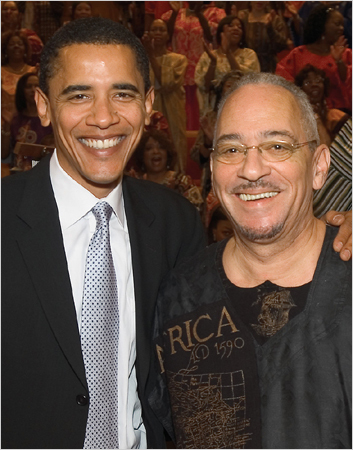 Obama’s spiritual advisor is the Reverend Jeremiah Wright Jr. According to a report by Ed Lasky in the American Thinker, Wright has a real bad attitude about Jews, white people and Israel, which he calls a racist state. He believes that black values are superior to middle class American values and that blacks should isolate themselves from the wider American society. He is a long-time friend of Louis Farrakhan, the leader of the Nation of Islam, who called Jews bloodsuckers. Does Obama disavow this nutty minister’s nutty views? No. But why? Is it because he was married by the nutty minister? Perhaps. Or is it because his daughters were baptized by the nutty minister? Perhaps. But what ever the explanation, it is no justification for his silence on the matter, a silence that suggests that Obama might share some of his nutty minister’s nutty views. As a member of the Senate Foreign Relations Committee, Obama opposed defining Iran’s Revolutionary Guards as a terrorist group. And he supports opening relations with Iran even if they continue to enrich uranium. Not terrorists? Come now. The Guards arm and finance Hezbollah, which is certainly a terrorist group. What sort of mark of terrorism is Obama looking for? Even if you plan on having negotiations with Iran, a country run by evil thugs, I don’t see the wisdom of going around saying this sort of thing. If this sort of foreign policy thinking reflects the way Obama plays poker, then he’s the biggest fish at the table.